When I say that our sidewalk project took months (MONTHS), I'm not lying. It was ongoing for the majority of our marriage. When I bought the house, the path off the back of the porch was paved with red flagstones, a weird rectangle of smaller grey concrete rectangles, more flagstones, and weeds. I hated this area. Didn't like the weeds. Didn't like the materials. Didn't like that it was HUGE. Besides the shear amount of work I knew this project would be, it was delayed because I waffled on what I wanted in the flagstones' place. Hubby found great, grey, brick-sized pavers that I thought would go well with the house. And they were on sale. Woohoo! So Hubby wanted to take some pics a few weeks back so that he could put one on a personal business card. I got to play photographer. This is his running-for-political-office shot. And this is generally what things look like around here. That dog lurves her daddy. See? She even smiles for the camera. Maggie poses ok with me, too. And then tries to give kisses. She's a good dog. I think we'll keep her. asfter the ceremony, we greeted a few guests before heading outside for some formal portraits. 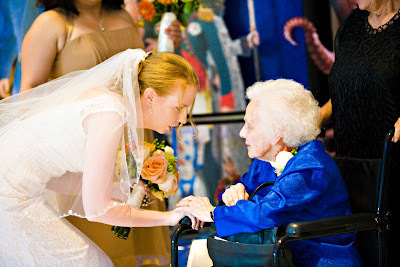 I was so happy that Hubby's grandmother could make the trip to the wedding. She turned 99 in January! Some traditional formals with his family and mine. And a few more shots with our bridal party. This time we could mix the ladies with the men. I love this first one. Our photographer had always wanted to get a shot with the guys holding the bouquets and the ladies wearing their ties. Fun! I'm pretty sure that everyone has things they would like to do in life. Things they want to accomplish or see or experience. I feel fairly strongly that people should write these things down. 1) A list helps you keep track of these items and brings them to the forefront of your mind. 2) Doesn't everyone like to cross things off lists? No? Is that just me? 3) It seemed like as soon as I made my list, I got some pretty incredible opportunities to mark things off of it. And 4), if you make your list public, odds are you have some pretty nice folks around you who will try to make things happen for you. So last Friday, my SIL, The Brother, Hubby, and I went to see professional tennis live. Turns out that sometimes the pros actually come to our city. SIL found out about it and got us tickets. We saw one doubles and one singles match. Let me tell you, these folks can hit some balls. It was impressive. I'd totally go see it again. You know, there were moments when the actual person who married us spoke. I've kind of missed all that here in the recaps. I can't remember if I mentioned it during the planning, but figuring out who would marry us was oddly easy for two people who didn't have a close personal relationship with a religious figure. When we were dating, we took a one-day marriage prep class. It wasn't taught from a religious perspective or through a church but it turned out that the male half of the couple who led it was actually a minister. We figured who better to perform the ceremony. Turns out, he's married lots of folks. 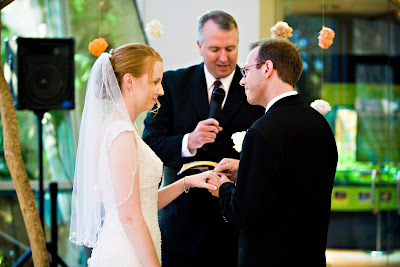 He did a fantastic job with the ceremony and with being flexible enough to allow us our own vows and readings. Plus, he's tall! Makes for good pictures and no need for a stage. Both of them are Maggie's doggie aunts. And just because I'm so proud, I'm going to show you that the ranunculus are still blooming. In my yard. In Texas.